The Fanes' saga may not be widely known to the general public. In order to make clear what's this all about, I'm adding here a short summary of the legend, together with an essential introduction and a few final notes about its interpretation. The Fanes' saga is a Ladinian tradition. Ladinians are a small (35,000 people) ethnical minority who live in the central valleys of the Dolomites, a wonderful mountain area on the Italian side of the eastern Alps. 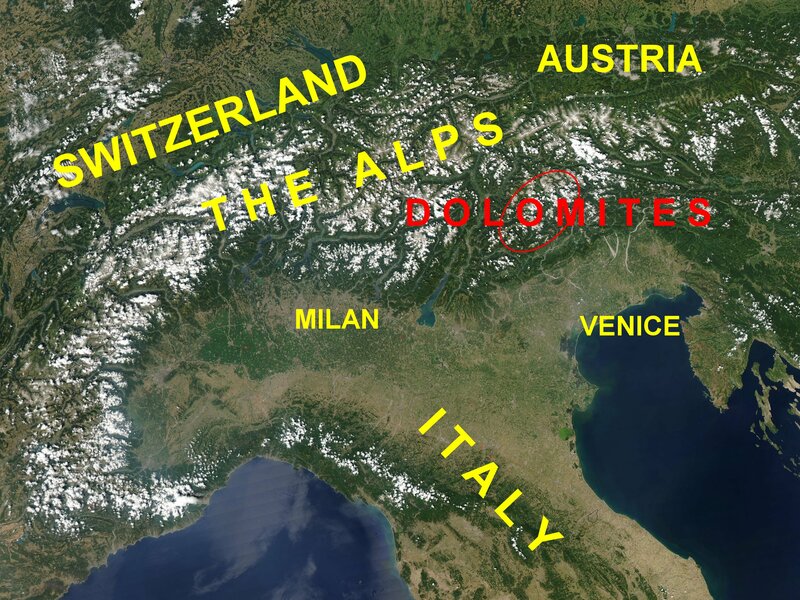 They are believed to be the descendants of a population that formerly inhabited most of the Alps, whom Romans called Rhaetians, and have been fragmented and squeezed by the opposite push of Germans from the North and Italians from the South. They speak Ladinian, a neo-latin language, different from Italian, similar to the idioms spoken in the Swiss Grisons and in the Italian Friuli. All Ladinian traditions were only preserved by oral transmission until the end of the XIX century. At that time they had long been badly neglected and were on the verge of slipping into oblivion forever. The German-speaking writer Karl Felix Wolff, author of the Dolomitensagen (Dolomitic Legends) spent several years on the field in his strenuous effort to collect, refurbish and reassemble all dismembered pieces of legend that he could retrieve. Unfortunately, Wolff was moved by an artistic better than by a scientific purpose, so that it is often difficult today to separate his well-intended "restoration" interventions by the genuine ancient Ladinian tradition. The Fanes' legend talks of a population that - in times so remote that the Ladinians themselves can just define "older" than all their other legends - lived on the high-altitude karstic plateaus between Cortina d'Ampezzo, east, and the val Badia, west. Indeed, the Fanes' legend is different from all other Ladinian legends: it's longer, it's structured as an epic cycle, and its contents are mostly quite unusual. The summary here below basically follows Wolff's version, with the exception that the epos of Lidsanel, that was inserted by Wolff but clearly has nothing to do with the Fanes, has been removed off. 2.1 The "myth of the origins"
Once upon a time, an anguana used to live in a cave at the feet of the mountain today named “Croda Rossa” (=Red Peak). Every morning, surrounded by marmots, she greeted the rising sun from the shore of a small lake. One day, a local woman comes back from a foreign country with a newborn girl, and dies at once. The anguana adopts the girl, who grows up together with the marmots: Moltina. She learns the marmots’ customs and language, and eventually she even gets able to turn herself into one. A foreign prince meets Moltina and falls in love with her. They decide to marry, against his family’s doubts. Moltina states that not only the marmots , but also the mountain itself is sharing her happiness. After her marriage, Moltina quietly lives at the castle. One day several queens meet together, and each is requested to narrate her ancestors’ story. Moltina has none, and gets terribly ashamed.The situation is rescued by a prodigy: the mountain in front, sharing Moltina’s feelings, turns purple red like her face. Moltina turns herself into a marmot and flees to her mountains. Later on, her husband decides to live at her home. One night, they hear the Fanes drilling their unskilled troops. The prince accepts to train them, leads them into battle, carries off victory and is nominated King. He builds a stronghold and has a marmot painted as an emblem on its walls. The Fanes’ royal dinasty will descend from the couple; the anguana foretells their glory and greatness. But the Croda Rossa will remain red forever. Many years later, the Crown Princess of the Fanes’ dinasty marries a foreign prince, but she dares not reveal him, as she should, of the “secret alliance” between the Fanes and the marmots. The king meets a fierce eagle who actually is the king of a remote island, inhabited by single-armed men; both kings agree upon a new secret alliance, that must be consecrated by an “exchange of twins”. The king keeps it secret to everyone, his wife included.The Fanes’ queen gives birth to a couple of twin girls, named Lujanta and Dolasilla. The next morning, however, Lujanta has disappeared, replaced by a white baby marmot. The king is left unaware of the exchange. A short time later, he orders a servant to bring the twins to the eagle, so that he can choose one of them. The queen is informed and makes it so that the servant can’t discover that one of the twins actually is a marmot. The eagle chooses the marmot, but she escapes and disappears in a crevice. Some time later, the eagle brings to the Fanes’ king a young eagle, his son, in order to fulfil the second “exchange of twins”. The king loses him, but when he comes back to his castle he finds that a single-armed baby prince has been delivered by the queen. The king is delighted and has the marmot, that was painted on the castle walls, replaced by an eagle. A boy who wishes to become a warrior arrives at the borders of the Fanes’ territory at dusk. Not far away a servant, who is coming back with the baby Dolasilla from having met with the eagle, is assailed by a powerful sorcerer, Spina-de-Mul (i.e. : mule-skeleton). who can assume the aspect of a half-rotten mule carcass and cannot be wounded by weapons. The boy attacks him in the darkness, repeatedly hitting him with stones, puts him to flight and eventually knocks him down. Then the sorcerer, subdued, names him “Ey-de-Net” (i.e. “Night-Eye”) and walks away. Ey-de-Net finds a splendid gem (the "Raietta") that the sorcerer had lost in combat, but gives it away to Dolasilla to stop her from crying. Once upon a time, under the ridge of mount Padon, there was a golden gate, locked all the time, that was the entrance to the country of Aurona, whose inhabitants had forever renounced to sunlight on the purpose to amass an enormous wealth in gold and gems. One day, a little hole opens up in the ceiling, and through it an old man can admire the beautiful outside world; but he gets blinded by sunlight. So the hole is hastily closed, but everyone is now craving for getting out, specially the princess, who spends long hours weeping just behind the gate. The young king of Contrin passes by and, in order to free her, pounds the golden gate with his sword seven days long, until he breaks in. He marries the girl, disregarding all other wealths; but the tip of his sword remains shining with the gate’s gold, so that the hero is nicknamed Sabja de Fek (Sword of Fire). The inhabitants of the Aurona scatter all over the world and the entrance to the underground kingdom gets forgotten and is eventually buried by landslides. The Fanes' king leads an expedition in search of a silvery treasure hidden on a lake bottom, and he takes with him Dolasilla, an adolescent yet. The treasure, which was expected to come from the Aurona, cannot be found; but in a cave nearby the Fanes find silver ingots and a small box with a piece of white skin and a grey powder. A group of dwarfs jumps out, reclaiming their properties, but the king ignores them. Dolasilla, on the contrary, gives them their box back. The dwarfs have her throw the powder in the lake, so that the hidden treasure may “blossom”, and themselves be freed from an enchantment. They give the box and the skin away to Dolasilla, so that she may have an armour built out of them. They foretell she will be an invincible warrior till her marriage, and recommend her not to enter the field if her armour should change its colour. Dolasilla is given an armour built of ermine skin and silver, that no weapon can penetrate. Out of the remaining silver, she also gets a bow, and out of what still remains several wonderful silver trumpets are built. Later on, the Fanes come back to the lake and find it covered by silvery reeds, that they use to build Dolasilla a set of arrows. They are unfailing arrows, and they have a high penetrating power. In a short time, Dolasilla becomes a very skilled archer. The king brings Dolasilla into battle and her unfailing arrows grant him easy victories. Dolasilla is triumphally crowned with the Raietta by her father on Plan de Corones. Years of continuous battles ensue, with great victories and large booties. After a battle, Dolasilla picks up a bunch of poppies from the helm of an enemy warrior she has killed. In the night she falls into a sound sleep, during which she dreams of the warrior, who exhorts her not to fight with magic weapons any longer. She would obey the warning, but the king asserts that it’s all just nonsense. Spina-de-Mul, on the purpose to retrieve his Raietta, tries to put together a coalition of tribes against the Fanes. He succeeds in convincing Ey-de-Net to take part in it with a group of Duranni. The warrior, who had never heard of Dolasilla, accepts at the condition of being granted to take the girl out of the battle unharmed. Before the battle, Ey-de-Net greets sunrise from the top of mount Amariana. The clash, in which the Eagle-prince fights for his first time, takes place in the small plain of Fiammes. While the Fanes are at an advantage, Ey-de-Net confronts Dolasilla standing motionless and uncovered but, as the archer girl wavers, Spina-de-Mul, who was hiding behind his shield, wounds her with an arrow. Ey-de-Net, instead of exploiting the Fanes’ momentary dismay, assails the sorcerer who has broken their deal. The Fanes prevail and the allies quarrel. Ey-de-Net will not come back home, because he wants to approach Dolasilla. He asks an anguana for advice; she addresses him at the Vögl delle Velme. In his turn, the old man sends him to Tsicuta, a sister of Spina-de-Mul’s. Ey-de-Net combs the mountain to no avail for a long time, until he runs into a raven, who explains him what he must do to meet her. She also tells him that the woman had been betrothed to the Fanes’ king before the latter married the Fanes’ queen. Tsicuta deals with Ey-de-Net coldly, foretells him that Dolasilla will break a promise she will make him, and that her destiny is shaped by her father’s ambition. However she gives him the correct advice to get in touch with the girl: he must have a shield built, so heavy that almost no man can be able to carry. Dolasilla quickly recovers from her wound. The artisans who had assembled the silver armour answer the king that it had been pierced by a magic arrow, against which it had no power. In order to protect Dolasilla from enchanted weapons, an enchanted shield was required, as the dwarfs of mount Latemar could build. The dwarfs speculate that the king’s order concerns the same shield Ey-de-Net had already ordered; when the finished objects is delivered to the castle, the Fanes discover that none of them is able to raise it from the ground. One day, Ey-de-Net arrives and proves able to carry it, so that he is hired as shield-bearer for the princess. Healed from her wound, Dolasilla enters the field again, protected by Ey-de-Net’s huge shield. The Fanes’ army appears invincible. When, one day, Ey-de-Net asks the king for his daughter’s hand, he gets indignant. But Dolasilla has fallen in love as well, and declares tired of fighting. Since Ey-de-Net can’t be replaced in his job, the king pretends yielding his consent, but delays the wedding and prepares a plot. He knows that both have promised each other never to fight again unless together. In his unmeasured greed for wealth, the king plans to have himself and his family buried in the Aurona. Therefore he secretly gets in touch with the enemy, the “southern peoples” who are going to wage war against the Fanes, and comes to an agreement with them: he will prevent Dolasilla from entering battle, so that the enemies will easily gain victory and take possession of his kingdom; in exchange, they will dig out for him the gates of the Aurona. Therefore, the king banishes Ey-de-Net, being convinced that Dolasilla will no longer fight without him because of her promise, and himself retires on the Lagazuoi waiting for events. Ey-de-Net leaves the kingdom. The Fanes are in dire straits: the king has disappeared, Ey-de-Net has been banished, Dolasilla refuses to fight although repeatedly invoked, and the overwhelming foes are approaching their borders. Pondering her difficult choice, either to fail her promise or let her people being destroyed, eventually Dolasilla consents to enter the battlefield again. At the same time, Ey-de-Net is looking for a silvano, a friend of his, but meets the raven again. The bird tells him the news that Dolasilla will fight again, against all odds. Since the hero feels betrayed because she broke her promise to him, and declares he will go far away forever, the silvano sends him consulting an oracle of lake nymphs . But they answer that Dolasilla had no other choice but to break her promise, and that soon she will die. Ey-de-Net tries to rejoin to the Fanes to defend her, but arrives too late. In the meanwhile, Dolasilla pays a visit to the silvano, Ey-de-Net’s friend, and learns that he has departed, never to come back. While returning to her castle, Dolasilla meets a crowd of weird ragged boys, who ask for her arrows; she gives away one each, thirteen in total. When she arrives at the castle, the enemy coalition is on sight, camped on the Pralongià. In the coalition’s camp, the army commander states that the Fanes’ king has betrayed them, and the day after Dolasilla shall enter the field against his promises; but, with the sorcerers’ help, he has succeeded stealing thirteen of Dolasilla’s magic arrows. He assigns his archers one arrow each and orders them to kill the heroine. Next morning, the Fanes are preparing for the fight but, when Dolasilla appears, her amour has turned dark. She understands the meaning of the prodigy, but pretends to be confident, so that her people don’t get discouraged. Dolasilla leads her people onto the verge of victory. For a long time the enemy bowmen are puzzled because they are looking for a white armour and not a black one. But they eventually understand their mistake and aim all their arrows at her. Although fighting like a lioness, Dolasilla falls and the Fanes break up. The princess dies while being carried back to the castle. Her body is burnt on the battlefield. The Fanes are routed. The Fanes’ queen takes command of the defence of the castle. News are brought that Dolasilla is dead and the prince is wounded. The castle is surrounded by enemies. The Fanes’ king, who was awaiting for the outcome of the battle on the Lagazuoi, is harshly derided by the winners, and specially by Spina-de-Mul, who throws in his face the tragic outcome of his betrayal. Even nowadays the king’s head, turned into stone with his pointed crown, may be seen on the mountain wall that dominates the pass of Falzarego. 2.8 The myth of the "Resurgence"
While the enemies assault the Fanes’ castle, Lujanta reappears and puts them to flight using her sister’s bow. But the castle is lost anyway. The queen reconciles with marmots; they explain Lujanta how to evacuate the last defenders from the castle, and foretell the chance to recover their lost kingdom.The last defenders of the castle escape through an underground passage, but are being closely chased. The dwarfs save them, by deviating a waterfall (the “Morin di Salvans”, i.e. Dwarfs’ Mill) so that it separates them from their pursuers. Eventually they arrive at a large hall, where marmots are hibernating. In the meanwhile the enemies pillage the country and destroy everything. Spina-de-Mul recovers his Raietta. According to the marmots’ prophecy, The Fanes fight for seven summers, each year retaking a new mountaintop. But the Eagle-prince is eager to recover all his father’s conquests, and he leaves. The Fanes gain their victories by means of their ancient tactics: they strike by surprise and then vanish into caves, where they also spend all winters. The Fanes and their enemies come to a peace settlement: the Fanes will get back the land that had been a part of their territory since ever, but none of their late conquests. When the pact is close to be agreed upon, the Eagle-prince comes back and rejects the conditions. As any further agreement proves impossible, war is declared. Shortly after, wolfes, crows and vultures are banqueting upon the Fanes’ bodies: men and women, old people and children, all of them massacred during the last desperate battle fought in their country’s heart, on the Furcia dai Fers, against an immense coalition collected from every corner of the world.Just about twenty people, all women and children, including the queen and Lujanta, escaped the massacre hiding among the marmots. The Flame Eagle arrives carrying the small boy who is the Eagle-prince’s son. He foretells that the kingdom will be reborn if the boy is able to retrieve the unfailing arrows before the silvery trumpets blow again for the “great time”. The eagle takes the job to lit a sacred flame every year in memory of the Fanes’ kingdom. He will fly the boy to Contrin, where he will learn the profession of arms by the reknowned local king. By moonlight, the queen and Lujanta row around the Braies lake in a small boat.They are waiting for the queen’s grandson to come back with the unfailing arrows. But he never comes. And one night the “great time” arrives: the silvery trumpets can be heard blowing from every mountain, but nobody is there to answer their call. The queen listens to them for a last time, then disappears to sleep forever on the lake bottom. But one day the “promised time” will come, when everyone will be resurrected and will live in peace. The historical frame is that of the advance of palaeo-venetic civilization in southern Dolomites, which took place about 800 B.C. Did the described events actually take place? We often see the narrators puzzled by topics they weren't fully acquainted with, or dropping possible highly dramatic scenes. The story, moreover, is that of a bitter defeat and not of a triumph: no good theme to glorify ancestors!. All these points indicate that the legend shouldn't be purely fictional, and is probably based on a sequence of events that actually did occur. Of course this does not imply that all details of the legend are equally "true". It is also certain that several even older myths have been incorporated into the saga. Please refer to other pages of this site for more details and explanations.